This is the cutest stamp. Maybe I love the dog because of the floppy ears which remind me of my miniature Dachshund, Samantha. 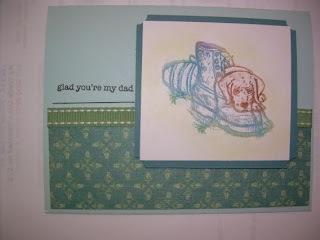 But with Father's Day right around the corner this great stamp set would fit a lot cards for the men in your life. "For Father" found in the Occasion Mini Catalog has four great stamps and will only be available for purchase until the end of June. Remember that all the stamp sets in the minis are die-cut so ease in assembly. The card above also uses the In Color paper and the double stitched ribbon in Wasabi Green which also won't be available much longer. 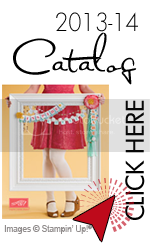 Add a package of the In Color card stock to your next order. You'll be glad you did.